Strange that a city of Manchester’s stature doesn’t have more high-end boutique hotels. 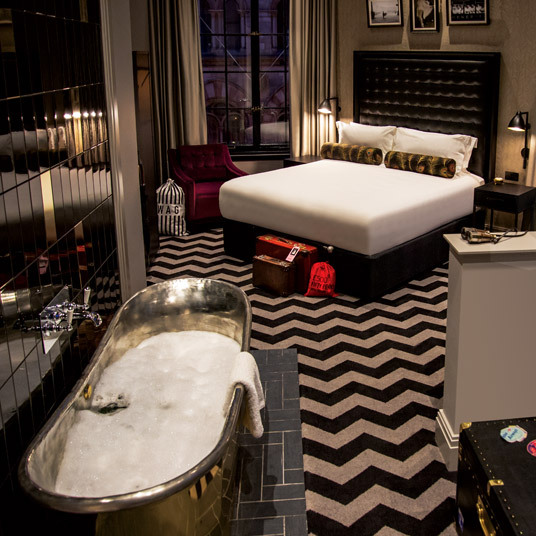 But don’t blame Hotel Gotham — they’re doing as much by way of remedy as one hotel can do. And while the name obviously references New York rather than Manchester, it’s less strange than it sounds; when you start from a Twenties Art Deco bank building by architect Edwin Lutyens, an interwar Manhattan vibe is a fairly natural choice. The atmosphere, then, errs on the side of glamour, the key note being Roaring Twenties decadence, with only a slight overtone of Batman-esque camp — full marks for exploring every connotation of the Gotham name. It bills itself as Europe’s sexiest hotel, and while we can say that’s perhaps a bit ambitious, they’re definitely on to something: the suites, particularly, have a bit of a pleasure-palace vibe, especially the Inner Sanctum suites, which trade views (there are no windows) for the utmost in privacy. On the sixth floor is the reception, as well as the hotel’s own restaurant, Honey. Meanwhile Jamie Oliver’s Italian, which predates the hotel, continues to operate in self-explanatory fashion on the ground floor. And the cherry on top is the seventh-floor Club Brass, a suitably exclusive member’s club which is also, of course, open to the Gotham’s paying guests.